NORBY IS AT IT AGAIN! That lovable mixed-up robot is back—and in more trouble than ever! Along with his sometimes fearless human companion, Jeff Wells, Norby has gotten himself into more trouble than would seem humanly—or robotically—possible. This time, even Norby himself can’t figure out how he and Jeff got into these intergalactic foul-ups. After all, being taken prisoner by a bunch of aliens from a distant universe wasn’t Norby or Jeff’s idea. And how could our heroes have known that they were really sticking their necks out when they accidentally travelled back in time…to the French Revolution? I have, in fact, very, very little to say about this one, because I can hardly remember it. I do remember who the villain turns out to be—Ing the Ingrate, from the first Norby book—but absolutely nothing else. 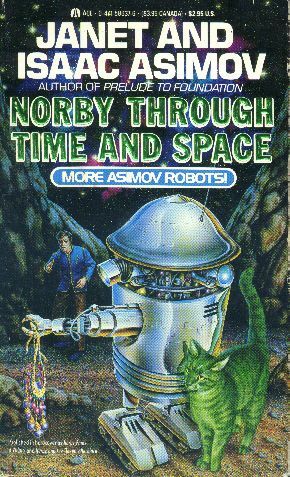 One therefore gets the distinct impression that, even in the Norby series, this is not much of a contender. Note that the omnibus edition I own has a slight problem with the blurb, which was clearly written with the understanding that Norby and the Queen’s Necklace would be accompanied by Norby and the Invaders, and not by this particular novel. These things happen, alas.